All for one, one for all! Have you ever wanted to be part of the Three Musketeers? 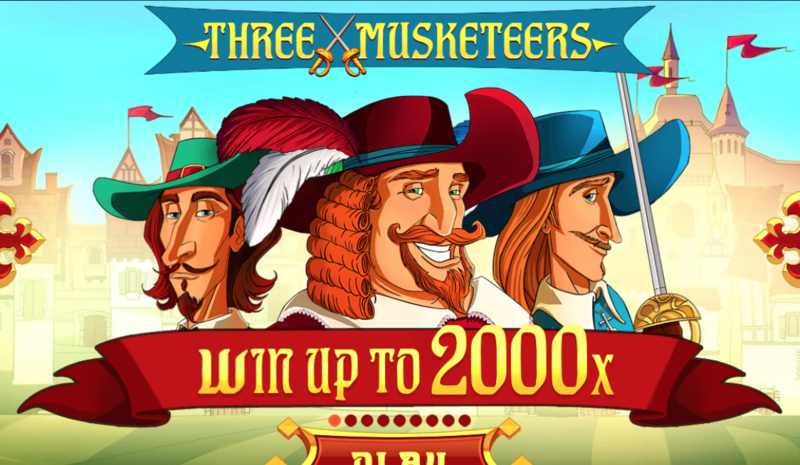 Well, now you can with Three Musketeers on EasySlots, a slot based on the famous trio. Three Musketeers is a 5 reel, 40 payline slot created by Red Tiger Gaming. In this slot, you'll join Athos, Porthos, and Aramis on their mission to fight for what's right. You'll get to see lots of swashbuckling action in this vibrant and entertaining slot. Become the ultimate duelling master and collect exciting cash rewards as you partake in features including the bar bonus feature, offer bonus feature and the wheel bonus feature. Three Musketeers is a 5 reel, 40 payline slot with a swashbuckling theme. You'll embark on an exciting adventure defeating evil powers alongside great friends Athos, Porthos and Aramis. The graphics are fun and colourful with lots of foaming tankards of beer and plenty of sword action. You'll become a true duelling master while you collect great cash prizes along the way. Three Musketeers comes with lots of fantastic features including a bar bonus feature, offer bonus feature and a wheel bonus feature. Join the Three Musketeers as they embark on another mission to fight against evil. Three Musketeers is a 5 reel, 40 payline slot created by Red Tiger Gaming with a swashbuckling theme. The design is beautiful with great 3D animations of the Three Musketeers. There's also a tense and upbeat soundtrack that puts you in battle mode. Behind the reels, you'll see the inside of a grand building with turquoise painted walls. The symbols include the standard playing card suit symbols, hats, swords, tankards of beer and a fleur de lis. The Three Musketeers are very active in this game and often shout out french phrases. The Wild Symbol - The wild symbol in Three Musketeers is the fleur de lis. The fleur de lis substitutes all other symbols to form winning combinations. 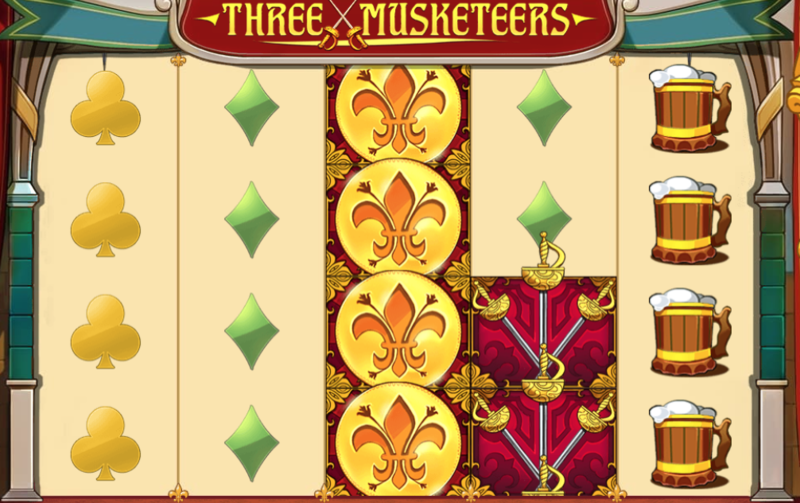 The Three Musketeers are also wild symbols in this slot. Musketeer Meter - Athos, Porthos and Aramis all have their own meter. Every time a musketeer lands, feathers will be thrown at the meter. Depending on where you land, varying amounts of feathers will be added. Once the meter is full, an exciting bonus feature will be activated. Bar Bonus Feature - The bar bonus feature is Porthos' feature. Choose a symbol from all of the symbols presented to make your way across the board. When you've reached the finish line, you'll get a prize. Wheel Bonus Feature - The wheel bonus feature is Arasmi's feature. In this feature, all you have to do is spin the wheel. When the wheel stops, you'll be given a multiplier or free spins prize. Offer Bonus Feature - The offer bonus feature is Athos' feature. In this feature, Athos will ask you to accept or decline cash prizes. Will you accept the right one? If you're up for a swashbuckling adventure then you will enjoy Three Musketeers. This Red Tiger Gaming slot has a fun theme and the graphics are great. The bonus features provide lots of entertainment and prizes worth up to a 2,000 multiplier. Search Easy for more games from this games provider.